Remember when places of worship were sacred? I have always been somewhat surprised when someone attacks a church – whether it be theft or vandalism. I remember as a child, I was taught that one should treat “God’s House” with more respect than you do your own home. I am not confessing mind you, but there may have been an instance as a kid when I stuck gum under a table in Sunday School. But I can assure you, if said instance may have happened, I felt guilty for weeks. It would seem that those days may be over – at least here. 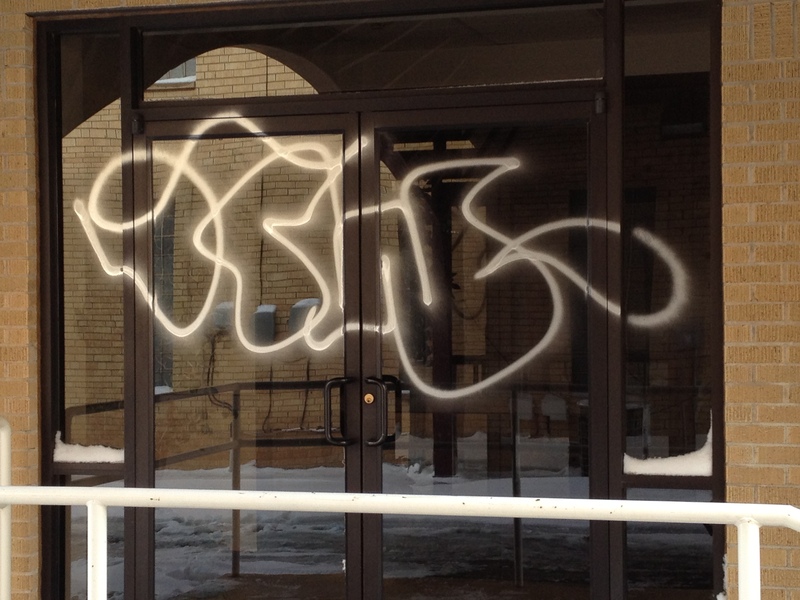 Christmas Eve our church building was vandalized. The only blessing in the whole thing is that nearly all the areas that were painted were glass. Either the vandals were not very good at what they were trying to do or they were conscientious vandals. Either way, I am glad the clean up will not be terrible. But the whole incident has caused me to think. I am so glad that the church is not a building. This reminds us that the building is just that – a building. It is the place that the church meets but there is nothing particularly special about it. If the church met in a barn, that barn would be sacred – not because of the barn but because of the people meeting in it. God’s people are the church and we cannot be held back by a can of paint. Now – where is my scraper? The Eve of that special day is upon us. We have waited all year for this. The last four weeks – we call advent – have been about the anticipation of this moment in history. It has all led to being excited about celebrating something that happened over 2000 years ago. Think about that for a second – for weeks we have awaited with hope and excitement the day that we would celebrate an event that happened thousands of years ago. What other event in human history caused such a ritual? But then again, it only takes one instance of divinity and humanity merging to cause such an uproar. It is here! Celebrate God’s breaking into humanity. Brush up against the wonder this year and let it change you! Merry Christmas from Clay In The Hands! This could be it. This could be the last post I make to Clay In The Hands. Weird isn’t it? I have been sharing my journey here for over 3 years and this could be the last time. According to the Mayan’s, the calendar ends tomorrow. I don’t know a single person who still follows that calendar but for some reason, the fact that the Mayan culture – which by the way has been virtually extinct for hundreds of years – failed to continue their calendar past tomorrow. The assumption by those who worry about these things is that the world will end when the Mayan calendar ends – as if that extinct culture had some crystal ball that told them the exact day of the world’s end. I really appreciate what Dr. Jim Dennison said this morning in his blog, Denison Forum On Truth and Culture. You can read what he said in full here. HIs point was that while we can’t say the world will end tomorrow, we also cannot say that it won’t. But that has nothing to do with the Mayan calendar. Jesus, the very son of God whose coming to earth we celebrate this next week, will return. Scripture is clear that he will come again. But scripture is also clear that we have no idea when that day will occur. If you knew for sure that the world would end tomorrow, how would you live today? The sobering truth is that the world could end tomorrow. None of us are guaranteed tomorrow so we need to make the most of today. How will make today count? This morning during my prayer and reading time I was reminded of something very simple but profound. I was reading in Psalm 37. The verse that I focused on was verse 4. In this passage, the writer tells us that we should “delight” ourselves in the Lord and when we do we will receive the desires of our hearts. On a cursory reading, we get the idea that if we follow God, God will make sure we get what we want. But when you look closer at the passage, that is not what the writer is saying at all. When he says “delight” he means more than give a cordial tip of the hat or an occasional prayer of thanks for what God does for us. The word delight carries the idea of complete enchantment – an all-consuming desire to please. When we look at the context – the other verses around this one – we see that the writer is reminding us that when we make God the focus of all we do, when our lives revolve around pleasing God and doing what is good and right, then God will give us the desires of our hearts. But here is the very simple yet profound idea the writer is communicating. When we live our lives with the one focus of pleasing God – really delighting in the Lord of all creation – then the desires of our hearts will line up with the plans God has for us. When we live in God’s perfect will (as Paul would call it in Romans 12) then our lives will be full and our hearts content; because when we seek to please God with all we are – that is the reward we will receive. Has Christmas lost it’s wonder for you? When you look at the eyes of a child as they gaze upon a brightly decorated tree or the presents under that tree – do you see the amazement? Do you still feel that same awe? Yesterday, we talked about the wonder of Christmas. I pray that, as adults, we don’t lose that same amazement we see in the eyes of children as we approach this most holy day. We know the story – many of us have heard it all our lives. If we aren’t careful and attentive, this season will pass us by and we will not have paused to truly consider why it still holds wonder and amazement for us today. The God of the universe decided to break into human existence – divinity and humanity merging – in order to save us from our mistakes, poor choices and sin. A woman was chosen to give birth to God. Even though she had never been with a man, she gave birth to a baby boy – God’s very son. Not only did God choose to come to earth under these scandalous circumstances, Jesus was born into poverty – a common man. And now, 2000 plus years later, we celebrate that birth. All of that should cause us to pause – it should cause us to feel amazement. It should remind us that there is so much more going on in this life than we can explain or even see. Don’t let the wonder and amazement of this season slip by you this year! Yesterday, I referred to the story of the magi that came from the east to see the new born king. Matthew chapter 2 tells the story and you can read it here. Think about that for a second. Three strangers show up asking to see a baby and all of the sudden the entire city, including the king, is concerned. Jesus was born and even as an infant, he was already starting to impact the world. As we know – that was just the beginning. Jesus’ coming shook things up. Jesus’ ministry was one of turning things upside down. Most of everything he did and taught was counter-cultural – it went against the grain in the first century and it remains to be the case today. In just over a week we will celebrate the in-breaking of Deity into the human existence – we will celebrate the birth of Jesus. We will remember that Jesus came to love and live and die. He came to teach us how to love and live as well. Today, we as followers of The Way are to be Jesus in our world.